I had gone to a pretty high-class society to interview someone for a story. On my way down, this auntie here got into the lift. From the liftman to the watchman, everyone playfully chided her. Once we were down, she asked me if she could get under my umbrella since it was raining. I offered to do the job for her if didn’t involve going too far. She handed me a 10-rupee note to get two packets of Parle-G biscuits. As soon as I stepped out, I immediately knew why she had ordered for them. Three dogs came rushing towards her. Once I got the packets she started feeding the dogs, “Yo yo yo yo,” she kept saying. “Every evening this ritual starts,” said the watchman half-irritated. 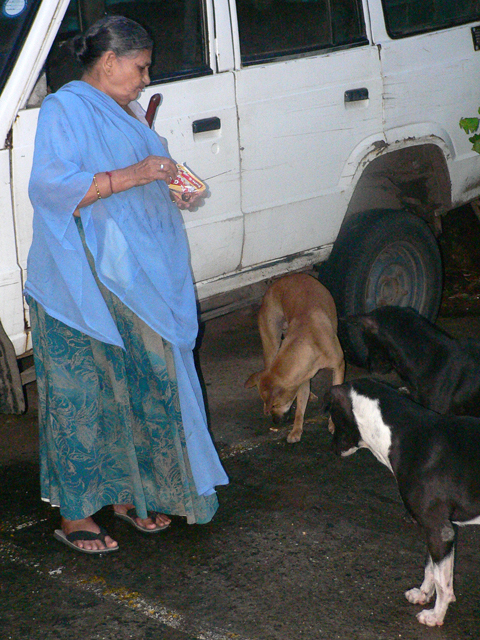 Feeding the dog was an obsession of sorts for this old lady. Old people, I always feel, should have some sort of obsession. I have seen it in my grandpa. His obsession among many other things was with news and finance. As age progressed, one by one, he started giving of his obsessions. And every time he dropped one, I knew my grandpa had grown a bit more older that day. P.S. Aplogies for the bad photograph. The light was failing and I didn’t have me Canon 350D on me. This photo was taken by Panasonic FZ3, my old P&S. This entry was posted in Personal and tagged dogs, lady, obsession. Bookmark the permalink.